After her movie career dried up in the late 1960s, Reynolds focused on her nightclub act. 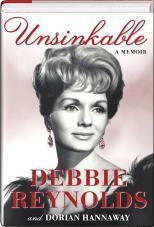 Reading Unsinkable, one gets the feeling that variety entertainment -- song and dance, jokes, imitations -- before live audiences was the ebullient Debbie's first love and true calling, not the isolated world of movie acting. Hollywood stardom was just an avenue to being famous enough to sell out a Vegas showroom or some regional auditorium. Anywhere she was wanted. Despite serious health issues in her later years, Reynolds continued to perform concert dates up to just a few months before her death. 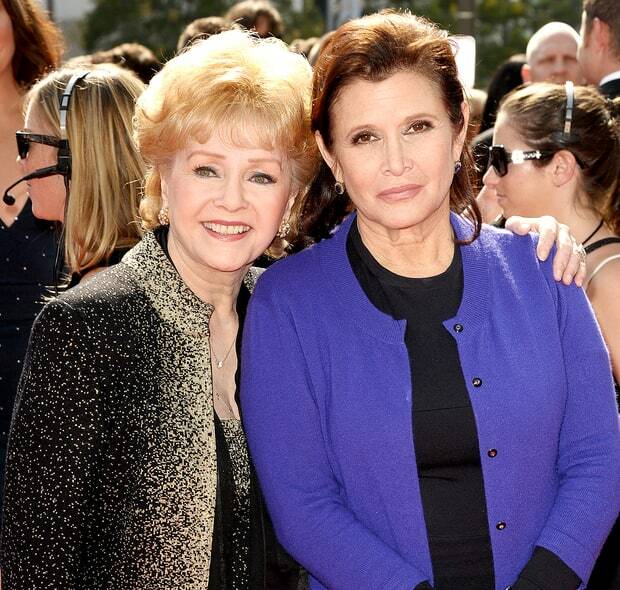 Debbie Reynolds and Carrie Fisher, 2011. Reynolds' famous offspring, the writer/actress Carrie Fisher, contributes the foreword to Unsinkable. She calls her mother "a good person, a kind person -- which would be a fine thing if these were the qualities that are consistently rewarded. But as most of us know, they are not." Media coverage of the recent deaths of Fisher and Reynolds, which occurred one day after the other, made much out of their mother-daughter bond. However, Carrie is only briefly mentioned in Unsinkable. It is Reynolds' not famous child, Todd Fisher, a sometime director and lighting designer, who stalwartly stands at his mother's side through the tribulations detailed in the book. Todd plays a major role in her business affairs -- rather reluctantly on his part, it seems. The dutiful son escapes to his ranch in Northern California whenever possible. Reynolds with her costume collection, 2011. Moving on from the dastardly Hamlett, Reynolds devotes the middle part of Unsinkable to detailing her lengthy but ultimately futile efforts to establish a museum built around her extensive collection of movie costumes and memorabilia. Here Reynolds seems more heartbroken than angry as plan after plan falls through. She also finds herself broke again. In keeping with the title of her book, Reynolds bobs back to the surface when the collection -- often dismissed as of minimal value -- fetches millions of dollars when sold piece by piece at auction. The money restores Reynolds' pride as well as her solvency. In Unsinkable Reynolds is more interested in venting about post-1980 happenings than reminiscing about her heyday as a movie star in earlier decades. But that bygone-era stardom is ultimately why this book exists. Therefore, Reynolds somewhat obligatorily devotes the final third of the book to an overview of her speedy rise from working class Los Angeles teenager with no show business connections (she landed a movie contract when an agent happened to catch her in a Burbank beauty contest doing karaoke to a Betty Hutton novelty song) to big name Hollywood personality. Reynolds in her movie star prime, 1959. Following a chronological list, Reynolds comments on each of her fifty-plus film appearances Not surprisingly, the classic musical Singin' in the Rain (1952) rates several pages, mostly unhappy memories of gruelingly hard work filming the dance numbers under the direction of an unfriendly Gene Kelly. A cameo role in a Dan Dailey-Cyd Charisse vehicle called Meet Me in Las Vegas (1956) gets a just a few lines, including -- "Honestly, I don't remember doing it." 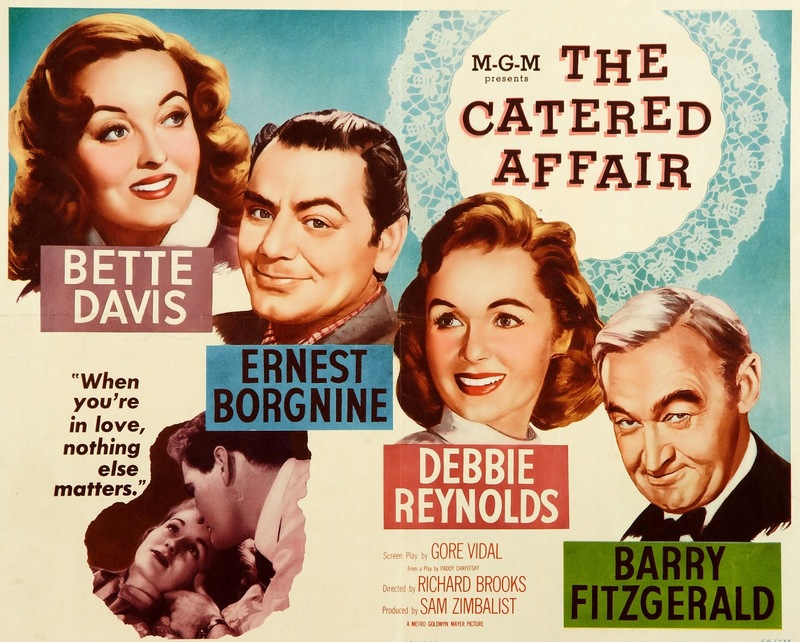 The Catered Affair (1956) -- A very 1950s, kitchen-sink style, domestic drama that offers up a Debbie so uncharacteristically reserved that if you missed the opening credits you may not realize it's her. Bette Davis and Ernest Borgnine co-star as Reynolds' parents, making one of filmdom's most unlikely family groupings. A frumped-up Davis is a blue collar Irish-American Bronx housewife obsessed with giving her daughter the kind of grand wedding that she herself never had. Reynolds is the sensible and sort of glum daughter who doesn't want the big wedding. Debbie's only black and white movie and an oddly serious outlier in her career. Tammy and the Bachelor (1957) -- This implausible tale of an illiterate girl brought up in rural poverty on the bayou by an irritable, moonshining grandfather is depressing if you give it any thought but you aren't supposed to give it thought. Tammy and the Bachelor was a box-office smash that solidified Debbie's star status. The title tune (which she inexplicably sings in the middle of this otherwise non-musical film) gave her a hit record and became her signature song. "Who played he bachelor?" makes a good movie trivia question. The answer is Leslie Nielsen, inappropriately glowering and too mature looking. Where was Robert Wagner when they needed him? 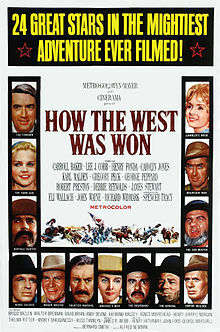 How the West Was Won (1962) -- Filmed in the three-screen novelty process Cinerama. This mega-movie about the folks who tamed the frontier looks back to pageant-style epics like The Ten Commandments and forward to the 1970s TV mini-series Roots. All roles are played by recognizable performers and Reynolds' character is at the center of the sprawling multi-generational story line. For this reason HTWWW can justifiably be considered the apogee of Debbie's film career though it is unlikely to come to mind when conjuring up the idea of a Debbie Reynolds movie. Reynolds travels by flatboat down the Ohio River with her farmfolk parents (Agnes Moorehead and Karl Malden) crosses the plains on a wagon train (led by Robert Preston), becomes a California dance hall girl, marries a caddish gambler (Gregory Peck), and finally ends up as an elderly woman in Arizona. The final scene offers a hamming it up Reynolds, in a gray wig and old person makeup, atop a horse drawn wagon. She cackles and back slaps away to her nephew and his wife played by George Peppard and Carolyn Jones who were probably struggling not to laugh. 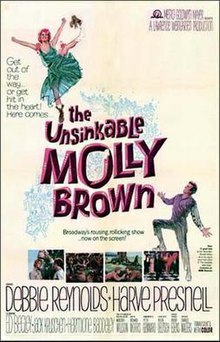 The Unsinkable Molly Brown (1964) -- This so-so film version of a minor Broadway musical about a Colorado farm girl who falls into a silver mining fortune and ultimately survives the sinking of the Titanic earned Debbie her only Oscar nomination and it was her own favorite of her films so it must be included on this list. In Unsinkable Debbie writes about how she saw so much of herself in the spunky character of Molly Brown and was determined to play the part on film. She discredits rumors that she stole the part from the director's choice, Shirley Maclaine, by offering to work for no salary. Whatever really happened behind the scenes, Maclaine, despite or perhaps because of her more citified air would have made a more interesting Molly Brown. Better yet, the oddly croaking voiced, upper crust accented Manhattan chanteuse Tammy Grimes who starred in the original Broadway production. Coincidentally, Grimes passed away in October 2016, just two months before Reynolds died. The Singing Nun (1966) -- About a guitar-playing nun who becomes a recording star. Very, very loosely based on a real-life Belgian nun who topped the charts in the early 1960s. This movie was the last film directed by studio-era old pro Henry Koster and also marks the beginning of the end of Reynolds' run as a movie star. The Singing Nun was released at approximately the same time as the Production Code breaking Who's Afraid of Virginia Woolf? The following year, the watershed year of 1967, brought Bonnie and Clyde and The Graduate and ushered out reminders of the 1950s, including Debbie Reynolds, no matter that she was not much older than many "New Hollywood" avatars such as Jack Nicholson and Dustin Hoffman, A linkage between the end of the Old Hollywood and the beginning of the New is Katharine Ross of The Graduate appearing in The Singing Nun as a wayward young woman who Debbie's nun character helps keep on the path of righteousness. The Committee Room, when just a little tyke, saw this movie in the theater and a song Reynolds sings in it "Brother John" left an earworm that remains lodged in the brain more than a half-century later. So beware. The Committee Room. Time spent with TCR, like time spent with a cat, is never wasted. These are the films of past that is very far I can not ven think of anyone who would want to watch these films with me let alone read the interview. I think that the main role of a woman is to be a mom and the housewife. And then if she wants she can work. She doesn’t need to forget about her children. And the good variant will be working from home pay someone to do my essay . Using this variant you can take all benefits from your time. Amazing Article about film Industry star. Thank you for sharing the post! It helps me know more about her. Most certainly, if you have never thought about comprobar correo, you probably do not really know how it is done. Well, even though you do not really need to know the specifics, you should consider learning a few facts about comprobar email. which is a immature share of the difficulties many people unrecorded with sect now, but but making improved lives for group that is direction on feat them much , getting them punter aid and making certain their kids get enlightened. For many small and medium organizations it is unnecessary and unproductive to have an in-house IT department. There is no reason to pay IT staff on a regular basis when you have the opportunity to hire IT Consultants Richmond VA and let them do what they know best. At Richmond Tech Firms you will find competent staff that will solve all of your IT related problems.